And A Player To Be Named Later: I'm Right; Everyone Else is Wrong. So, tooting my own horn in this blog. I’m going to go over past blog points where I said stuff that no one agreed with, and it turns out I was right. Back in December, I wrote a blog post saying I hated, hated, hated this trade. I was looking forward to seeing Austin Jackson play for the Yankees, didn’t want to get rid of Phil Coke and Ian Kennedy and absolutely felt awful getting Curtis Jackson. SO, was I right? Granderson is batting .243 and a 320. OBA. Austin Jackson, the early front-runner for ROY, has cooled off, but is still batting .302, or 59 points higher than Granderson. He plays a flawless CF and is still only 23, and is far cheaper. Phil Coke has a flat 3.00 ERA and would fit nicely into the shaky Yankee bullpen right about now. And Ian Kennedy has a 3.77 ERA and has given up only 83 hits in 100 IP. I'll put that one in the "hooray for me" category. Allowing Brett Gardner To Be A Starter. Most thought the Yankees, one year after signing 2 of the top free agent pitchers on the market, that the Yankees should sign another one. 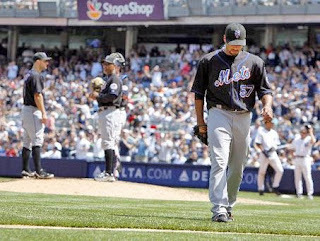 One guy even thought the Yankees should ignore Roy Halladay to the point of signing John Lackey. In any event, I was against the signing. Here’s what I wrote last Nov. The point being that, of course, John Lackey is an excellent pitcher and any team would love to have him. 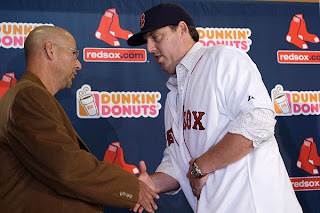 But the risk-reward analysis, mixed with the fact that everyone knows that the Yankees have overspent in the past and will try to use that to their advantage, makes Lackey a real hazardous sign. Right now, Lackey has a 4.77 ERA, a 1.57 WHIP, has given up the 4th most hits in the AL. He makes 18.7 million dollars this year and is signed through 2014. I should be running the Yankees, right? ...when you consider his last three years in Boston, his innings per “games started” dropped each of those seasons, while both his “hits” and “runs” surrendered rose dramatically (his WHIP was a ghastly 1.615 his last year at Fenway), there’s something to be said for proceeding with caution on this one. Maybe there’s more to Boras saying, “Zito-type” when talking about Lowe. The last two seasons have shown Lowe to have a 4.6 ERA. He led the NL in hits allowed last season with 232. He had an 8.35 ERA last season in interleague games, which is a terrifying thought when you consider he would have been playing in the AL all season. Lowe is in the second season of a 4-year 60 million dollar contract. The Braves tried to trade Lowe this past offseason, but could not find anyone to take him. Have to go back to 2007 for this one. And unlike Mike Lupica who wrote seemingly once a day from 2008 until the beginning of this season, that the Yankees should have traded Hughes for Santana, back in early 2008, I voted against it harshly. Mainly for one reason; his arm strength was beginning to wane. An in the NL, in a pitcher-friendly stadium, that could be covered. In the AL East, in Yankee Stadium, it would not. So what has happened. Well, firstly, in interleague games the past 3 seasons, Santana, in 70.1 innings, has earned a 5.01 ERA. And after a fine first season with the Mets, his ERA has climbed each season. His K=9 has plummetted this season and his H/9 has gone up to the highest its been since 2001. In short his fastball velocity has dropped 2 mph since 2008 and almost 3 mph since 2007. Santana has been trying to compensate by throwing more sliders and 2-seamers, but with the velocity of his changeup dropping as well, his overall arsenal isn't as dangerous as it once was. Even the major media peeps are starting to get wind of this. And Santana's velocity will only get worse, not better. All kidding aside, I am wrong often and spectacularly, but all the above articles I wrote basically follow the theme of the Yankees should be extra, extra cautious about trading prospects for big stars, and cautious about signing big ticket free agents. Not that they shouldn't have signed Sabathia and Teixiera—I was for both of those—and I was a fan of the Swisher trade as well as the Pudge Rodriguez trade. It's just that cliche's are true. Sometimes the best trade/deal is, is the one you don't make. Nobody (but you) thought Gardner would hit over .300 this deep into the season. Good call. Lackey has always (in my mind) been a guy that gives up hits but wears you down and eats innings. His walks are significantly up over history so to me that is most alarming. Lowe was overpaid by the Braves. He is a decent 4th starter, unfortunately because of injuries etc. he has been the 3rd starter and inconsistent. You never know how Santana would have done, he was "the man" for the Mets, maybe he put more strain on his arm because of it. Maybe with the Yankees and Pettitte, Wang, Mussina and an emerging Chamberlain he would have been a little more relaxed and with different pressures (Yankees after all). 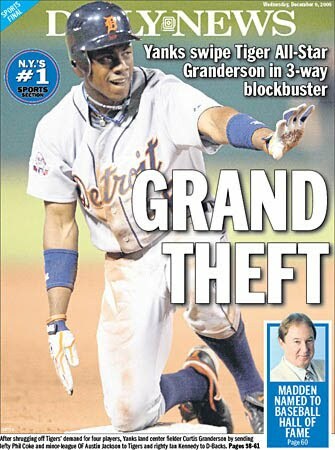 The Granderson trade was a great call up until this point in the season. I felt they gave up too much, but we'll have to see how it plays out in the 2nd half. You are absolutely right about Jackson, but I love Granderson's play in CF. Also, I think Ian Kennedy is over-rated. I don't trust his stuff. Gardner was a home run call. Round the bases as you see fit. Lackey and Lowe were great calls as well. Lowe (especially) and Lackey (secondarily) have shown a lot of signs indicating wear and tear. In an era where (I assume) there's no HGH, neither pitcher will do any better. MUAH, MUAH, MUAH (that's a European kiss), on the Phil Hughes call.